If you need a well-defined music converter and not getting proper software then we guess you need to check this out. 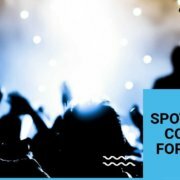 Here we will discuss Audfree Spotify Music Converter which has turned out to be one of the preeminent and unprecedented technologies in terms of music converter. The foremost feature of this software is that it enables the user to download music tracks for the offline use as per the required audio formats. Further, it permits in splitting the DRM out of the song so it can be accessible in all sorts of devices without pointing out for precincts. It is all because of its finest features around 70 million premium users and 100 million free users worldwide are gleefully using it. Now let us get into the detail about this software with an in-depth review. Make sure you have installed the app on your operating system otherwise you will get a message shown in the screenshot. Copy and paste your Spotify track link here and Audfree app will automatically start downloading your favourite music track. Select output preference of your choice such as music format, sample rate, bit rate after adding the songs from Spotify. Now your favourite songs are added and you have selected the output preference, click on convert button and the program will begin downloading your songs automatically. All your songs are downloaded, you can find the location of your downloaded tracks in your history folder. 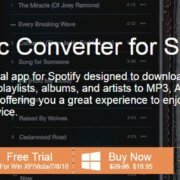 What are the pros and cons of Audfree Spotify Music Converter? Let us start by discussing it pros first. There are around 35 million songs that can be accessed by both sets of users that are premium and free. Audfree Converter can be accessed on devices like Mac, OSX, Windows, Android and likewise. Though Ogg Vorbis does not allow the song to listen on some devices, there is a trick as well to overcome with this very issue. 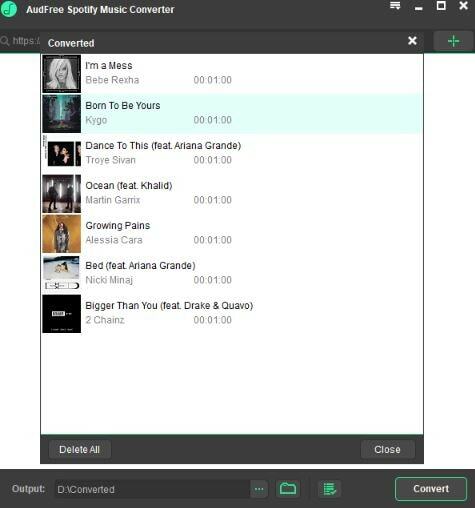 If the user is using this converter with windows then with the help of windows Spotify playlist downloader the songs can be converted in the desired formats like AAC, M4A, MP3, FLAC, M4B, AAC and so on. Using this method the songs does not lose its quality and has its raw presence. 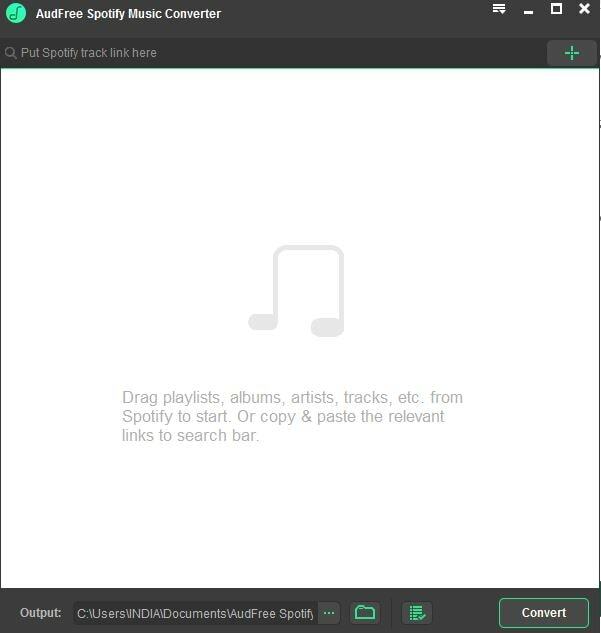 Smooth drag and drop method helps the users to download the music track from Spotify. The feel is same as that of premium and is free of cost. Spotify to MP3 converter is the right solution for all those users who want to download and convert the tracks into the required MP3 format. The added advantage of this tool is that it is freely accessible for both premium and free users plus can be used anywhere and anytime. Spotify music DRM remover helps to cut back the encrypted DRM copyright technology. Plus using this tool any music track can be downloaded or played without any trouble and that too on all the primary devices. The spontaneous GUI format makes the use of the converter effortless for its users. The user needs to copy the required song link, and the work is done. The coolest part of this music converter is that it can be used on all the major platforms and devices. Some of them are Apple, Microsoft Zune, Sony Walkman, and Creative Zen. It can also be further used on Google Home, car stereo, MP3 players, game consoles and the list goes on and on. If the user wants to transfer the music track on to other devices, the same can be done, and the permissible ones are SD cards, iTunes library, USB flash drive, etc. It means the user can store the music tracks with them and can use enjoy it anytime. Apart from the above-listed advantages, Audfree Spotify Music Converter has some drawbacks too. Here are the listed ones. The Ogg Vorbis format enabled in this convertor prohibits its use in some of the devices including MP3 players. The premium subscribers are not permitted to make use of the song in all the popular players due to the DRM encrypted copyright technology format. It has certain limitations not only for free users but even for the premium users as well. 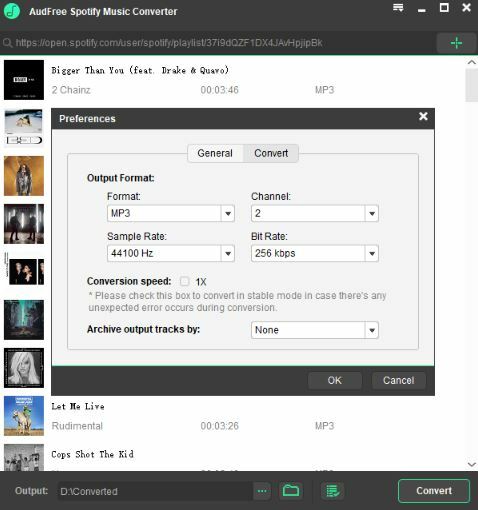 Though Spotify to mp3 converter lets the user download and convert the music tracks in MP3 format, but it only streams online with regular ads for the free users. When it comes to batch download the response of the converter is not as per the expectations. Free license campaign lets the user grab the permissible authority to use this software for whole life with just two methods – review and share. 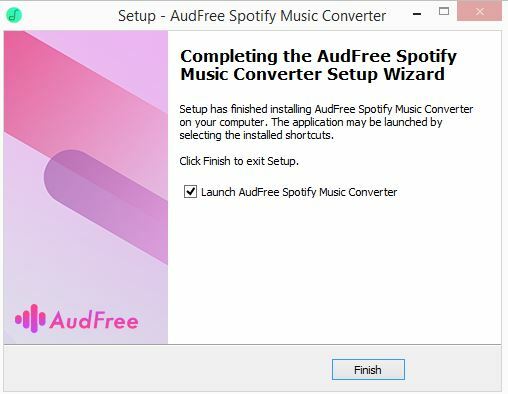 A free trial version of Spotify Music Converter is an excellent approach as it lets the user to first check the programs meticulously and then go forward with the payment option. 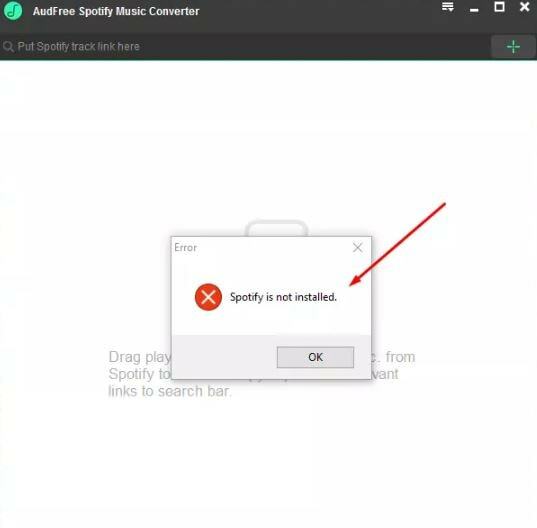 If the premium user is not at all satisfied with the Audfree Spotify Music Converter, then there are specific terms and conditions listed in the refund policy using which they can ask for the refund. Audfree Music Converter comes with 5X faster speed. It is a 100% secure interface along with all-around customer support. If we ignore its boundaries and disadvantages the Audfree Spotify Music Converter deserves thumbs up. Plus most of its demerits have some or the solutions and if the user knows how to use it; it can turn out to be seamless software. Along with this the features of downloading, transferring, storing and easy access with most of the devices and formats are also considerable. Spotify is endeavoured towards enhancing the features of the converter considering its customer’s demands, and in the anticipated time, it will let its user take pleasure of listening to the full-fledged catalogue of songs without any bumps.